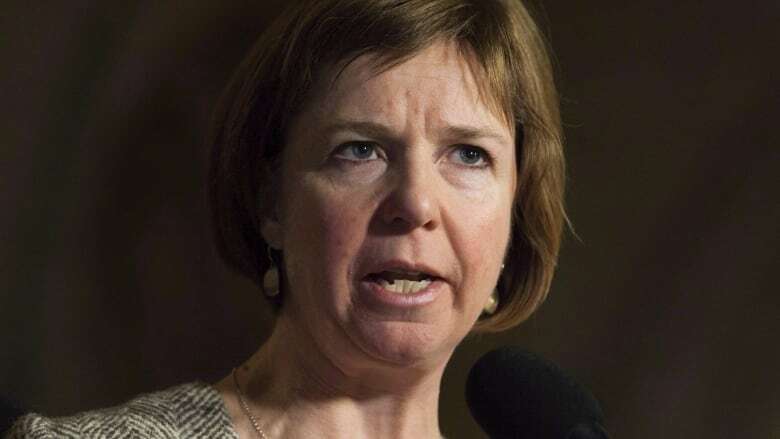 NDP MP Sheila Malcolmson is leaving federal politics to seek a provincial seat in the British Columbia legislature as the province faces a potential political shift. But it's not clear when she intends to give up her seat in the House of Commons. NDP B.C. Premier John Horgan announced Malcolmson's move during a news conference in Nanaimo today, saying she will make health care, public education and affordable housing her top policy priorities. "Sheila is perfectly suited to step into Leonard's formidable shoes, and working together, the city, the province, and with a woman of experience on issues at local government as well as federal politics, I couldn't be happier," he said. Malcolmson said she was not abandoning the federal party, which is struggling with sagging public support and slow fundraising. "I'm very proud that Jagmeet is our leader. I support him absolutely," she said. Malcolmson said she hopes her move will not trigger a federal byelection or interrupt service to her constituents. The federal general election is still a year away and Malcolmson did not explain how a byelection could be avoided, saying only that more details on timing would be released eventually. NDP Leader Jagmeet Singh said Malcolmson is part of the NDP's "greater family" and will continue to serve in a progressive government at the provincial level. While the list of departing MPs grows, he said he has confidence in his team of candidates. "We know that we're going to have a strong team come the next election, we're going to have a great team of MPs that will be returning, as well as a bunch of new, exciting candidates that we'll present in the upcoming election, and I'm excited about the potential for that," he said. Linda Duncan (the NDP's only MP from Alberta), London-area MP Irene Mathyssen, Ontario MP David Christopherson and Quebec MPs Hélène Laverdière and Roméo Saganash have all announced they do not plan to seek re-election​. Former NDP leader Tom Mulcair already has stepped aside and B.C. MP Kennedy Stewart left to launch a successful run for the mayor's office in Vancouver. Singh has said he will run for Stewart's seat when the byelection in Burnaby South is called. Timing for the moves is critical, because when Krog officially resigns, it will trigger a byelection that could change the power dynamic in the provincial legislature. The NDP and the Green Party have between them 44 MLAs in the B.C. legislature. If a Liberal candidate wins the Nanaimo byelection, it would give the Liberals the power to block provincial legislation and defeat the government, triggering a provincial election. Nanaimo has voted NDP in 13 of the last 15 provincial elections, but B.C. Liberal Leader Andrew Wilkinson has said he hopes to win the riding.